On the morning of Thursday, April 20, at 10:35 a.m., a crowd of faculty and staff members and students gathered in Hanaway Theatre in the Silver Center for the Arts. Dr. Sara Jayne Steen, escorted by Professor Peng-Khuan Chong and Student Body President Jeremy Foskitt, mounted the steps to the Hanaway stage and stepped to the lectern to formally accept her appointment by the USNH Board of Trustees as the next president of Plymouth State University. Trustee Gene Savage ’58, chair of the Presidential Search Committee, also praised Steen highly. “Dr. Steen’s extensive background in public higher education, both as a teacher and as a senior administrator, positions her to be a very effective leader at Plymouth State University,” he said. 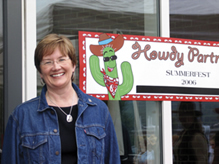 Sara Jayne Steen comes to PSU from Montana State University (MSU) where she served as dean of the College of Letters and Science from 2003 to 2006. She brings nearly 30 years of experience in higher education as a faculty member and senior administrator. 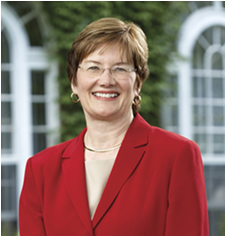 Steen assumed the PSU presidency on July 1, 2006 from Dr. Donald P. Wharton, who has retired after serving as Pymouth State’s president since 1993. “It’s very clear to me that the life I have is a much better life than I could have imagined, in part because of good decisions other people made—good decisions my parents made early on, about being focused on education,” Steen said. Like many Plymouth State students, she was the first in her family to attend college, and she did so with the help of scholarships, part-time work and wise planning on the part of her parents. As an undergraduate, Steen attended Bowling Green (Ohio) State University and received her B.S. in Education (English and Speech). She went on to pursue an M.A. in English, which she received from the Ohio State University before returning to Bowling Green for her Ph.D. In 1996, MSU recognized Steen’s outstanding contribution as a teacher by presenting her with their President’s Distinguished Teaching Award. Steen’s scholarly work has two parts. “One is discovering works by Renaissance women writers, and the second is learning how to assess those works and how to re-evaluate what we know of familiar writers when we can bring other voices to the conversation,” she said. “You ask different questions of Shakespeare if you’re also reading Arbella Stuart. And that has been exciting as well. There’s an impact on the curriculum in terms of the questions you ask.” She has published five books and many journal articles and has presented numerous papers and workshops. One of her books, The Letters of Lady Arbella Stuart (Oxford University Press, 1994), tells the story of Lady Arbella through Stuart’s own letters to relatives, her husband, the royal family, court officials and friends. “(Stuart) was a claimant to the throne. She married—without King James’ permission—another claimant to the throne. They were imprisoned separately, they escaped separately, they fled to France separately. He made it, but she was recaptured. She died in the Tower of London,” Steen explained. 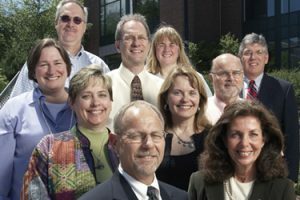 In 2002, Steen participated in the ACE Fellows Program, a leadership development program for vice presidents, deans, department chairs and other college and university administrators, sponsored by the American Council on Education. For Steen, the fellowship involved spending a year in residence at the University of Delaware. ACE fellows work directly with presidents, observe and participate in key meetings and events, and take on special projects and assignments with an experienced team of mentors. As an ACE fellow, Steen was able to participate in national meetings and seminars, visit other campuses around the country, and work with international educators. According to the American Council on Education, of the 1,500 ACE fellows to date, 300 have become chief executive officers at institutions of higher learning. As dean at MSU, she led a large and diverse college of 15 departments and eight centers, offering 80 undergraduate and graduate programs of study. She was active with alumni and the community and in funding new campus classrooms, laboratories, and buildings. Steen’s husband is aviation writer Joseph Bourque, who also holds a Ph.D. in comparative literature. They have three grown children and two grandchildren. In addition to her love of reading and of playing the piano, Steen enjoys hiking and biking, activities for which the Plymouth area offers many opportunities. President Sara Jayne Steen and her husband, aviation writer Joseph Bourque, enjoy the summer weather in the garden of the President’s House on the PSU campus.